Victor Berger, the son of an innkeeper, was born in Nieder-Rehbach, Austria-Hungary, on 28th February, 1860. His father's fortunes declined during his childhood. After attending the universities of Vienna and Budapest, Berger emigrated to the United States in 1878. Berger's family settled in the German-speaking city of Milwaukee, Wisconsin. He became a language teacher and in 1889 joined the Socialist Labor Party. Berger's involvement in radical politics resulted in him losing his job. In 1892 Berger established his own German-language daily newspaper, the Wisconsin Vorwarts. When this closed Berger replaced it with the Social Democratic Herald. 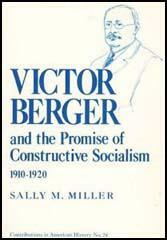 Berger was a political reformist and revisionist who supported the theoretical views of Eduard Bernstein. As his biographer, Sally M. Miller has pointed out: "Berger advocated educating the enfranchised proletariat while pursuing electoral politics. As a pragmatist, he believed that Marxist principles must be modified to meet the opportunities presented by changing political and economic conditions, an approach that led orthodox Marxists to call him an opportunist." In 1901 Berger joined with Eugene Debs and Morris Hillquit to establish the American Socialist Party. The party was very strong in Milwaukee and played a major role in the city's government for the next fifty years. 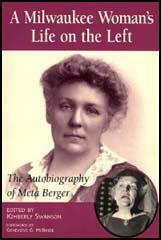 In 1910 Berger became the first socialist in the United States to be elected to Congress. The following year he proposed a bill to provide old age pensions. Sally M. Miller has suggested that Berger was a "virulent bigot, believing that groups were innately unequal." He argued that "white civilization" in the United States was threatened by the influx of "new immigrants". Berger also believed in the "absolute inferiority of American blacks". Berger was a strong opponent of America's involvement in the First World War, describing it as a "the wholesale murder in Europe". However, as Shane Hamilton has pointed out: "the main thrust of Berger's anti-war stance was socialistic, not pacifistic." In 1918 Berger was charged under the Espionage Act and after being found guilty was sentenced to twenty years in prison. While free on appeal, Berger was elected to Congress in 1919 with an increased majority. In 1921 the Supreme Court overturned Berger's conviction. As well as representing the people of Milwaukee in Congress, Berger edited the Milwaukee Leader (1911-1921) and served as chairman of the American Socialist Party (1927-1929). He was a strong opponent of the American Communist Party and warned against the "folly of imitating Soviet models, condemning the concept of the dictatorship of the proletariat." A collection of his speeches and editorials, Voice and Pen, was published in 1929. Victor Berger died on 16th July, 1929, from injuries sustained in a streetcar accident in Milwaukee. Ethical pacifism played a minor and relatively insignificant role in Victor Berger's opposition to World War I. In fact, on several occasions Berger placed his opposition to war on the shelf and focused his attention instead on the potential boost war could provide for the Socialist cause. On the eve of Germany's declaration of war on Russia, Berger wrote his wife that the imminent war could be "a good thing because it would hurt both the Czar and the Kaiser - and surely hurt the cause of monarchy and absolutism in Europe." Certainly Berger did not view the war as "a good thing" for very long, but as the war first got under way, he interpreted the fight in Europe as a potential boost for the Socialist cause. Similarly, when America first became officially involved in the war, Berger viewed American participation in the war as a possible boon to the American Socialist cause. Berger thought the military's great and immediate demand for food, shelter, and munitions would force the government to adopt socialist ideas by running industries, fixing prices, and coordinating the distribution of goods. Berger's prediction was not far off the mark on this point, for countless government agencies were created during the Wilson administration, including the War Industries Board, to set production schedules, standardize production procedures, and coordinate government purchases. Berger believed the government would also have to assume control of all means of interstate transportation and communication (one of the major goals of the Socialist program) in order to effectively prosecute the war. Thus, Berger did not immediately condemn America's involvement in the war on moral grounds. Instead, he viewed the situation in the context of socialism, stating that "There will be no return to the old order, once we shall have started on the path of collective activities." Berger's opposition to war was complex and not necessarily based on any sort of moral pacifism, for he was often willing to overlook the ethical concerns of war in order to view the possible benefits war could provide for the Socialists' political cause. Also, in cases of sustained repression of human rights, or if a country wrongfully invaded another country, Berger defended war as a practical means of defense. As he once commented in a Congressional committee meeting, "war sometimes cannot be avoided." Although Berger certainly did oppose World War I on moral grounds, calling it "the wholesale murder in Europe," the main thrust of Berger's anti-war stance was socialistic, not pacifistic. If ethical concerns were not the driving force behind Berger's opposition to World War I, neither was his opposition simply a result of his German heritage. In fact, readers of the Milwaukee Leader (a great majority of whom were of German descent) often attacked Berger for his paper's unsympathetic coverage of Germany's involvement in the war. While other Milwaukeeans of German descent openly supported the Fatherland in the first years of war, Victor Berger "told the pro-Germans in plain words that their attempt to express the European partisanship through any old party will be a failure, and that they can not express such partisanship through the Socialist Party because it is pro-American to the core." The Milwaukee Free Press, responding to Berger's lack of sympathy for the German cause, labeled him "the original prophet of ill-omen for the German cause" and accused him of trying to "arouse prejudice against the German emperor." Berger rarely tried to hide his distaste for the autocratic regime of the German Kaiser; unfortunately, many Milwaukeeans could not accept attacks, whether justified or not, on their beloved Fatherland. As his daughter later noted in an unpublished biography, "Papa...hated the Kaiser. In Milwaukee, that didn't increase Papa's popularity." This lack of allegiance to the German cause may have been the primary reason for Berger's defeat in the 1914 Congressional elections. Berger's opponent, the incumbent Republican William Stafford (Berger had lost his 1912 bid for reelection to the House), coasted to victory by attacking Berger for not sufficiently supporting the German war cause. Thus, if Victor Berger's opposition to World War I resulted from his allegiance to the German nation, he certainly did a poor job of indicating this fact to his fellow German-Americans.